You can book appointments online by clicking on the link at the top of this page. If you do not have a username and password please contact the practice. Alternatively please ring the surgery to book an appointment. The receptionists may ask the nature of your condition in order to assess the degree of urgency and help you to obtain the earliest appointment. All information given is treated with total confidentiality. Urgent cases are seen on the day. You can call from 8am to request an appointment that morning and from 1pm to request an appointment that afternoon. 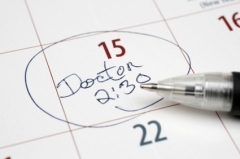 If your condition is non-urgent, you can expect to see a GP within two working weeks. You may have to wait longer if you want to see particular GP or wish to book an appointment for a particular day or time slot. If you don’t need an appointment within two working weeks, you also have the option to book up to 6 weeks in advance if this is more convenient for you. Nurses based in our practice treat patients for a wide range of common conditions. You can expect to see a nurse within one working day. Please say immediately if your call is an emergency. Please tell us if you would like a staff member to accompany you during an examination or a private room to discuss any matters. Remember that the results of tests can only be given to the patient. If you need an interpreter, please inform us in advance so we can arrange a longer appointment and interpreting services if necessary. Call for a home visit or urgent appointment before 10:00. We do not take requests for repeat prescriptions over the phone. Ring for test results after 14:00.